Handling Tips: 50°F. Do not chill. General Information: This small pear shaped melon has a very soft, edible, velvety skin. The skin is light green with streaks of purple. The flavor is mellow, combining cantaloupe, honeydew and cucumber. 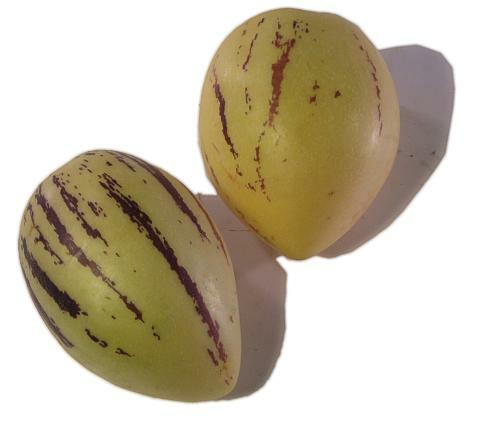 This melon is not particularly sweet, but can be eaten out of hand or combined with other melon and fruit. The flesh of the Pepino is quite fragrant and combines the qualities of a cucumber with the flavor of both cantaloupe and honeydew. Applications: Pepinos are often enjoyed in fruit or spinach salads or simply cut in half and served individually, topped with a sprinkling of fresh lemon or lime juice and chili powder. When served, an unripe pepino can be baked like a squash or when ripe, cut in half and served like a melon. This melon can also be used as an appetizer or an ingredient for salads, beverages, and sorbets. For storing, the pepino can ripen at room temperature or when ripe, can be stored in the refrigerator. History: The pepino, Solanum muricatum, originates from the Andean region and has been domesticated since pre-Hispanic times. At present, it is known only as a cultivated species. Its names in native languages and representations on various ceramic objects of the Chimú and Paracas cultures are proof that it was a widespread and important crop in those days. This was not so during the settlement or the Republic. During the settlement, the Viceroy Melchor de Navarra, Count of la Palata, prohibited consumption of this fruit and gave it the pejorative name of "mataserrano" (highlander killer). The Spanish word pepino might have been intended to facilitate the introduction of Cucumis sativus L. (Cucurbitaceae), a species also known by this name, as the names have been confused since then. On the northern coast of Peru (in the Virú and Moche valleys), farmers believe that if pepinos are eaten after drinking liquor, death may result. Names and beliefs have contributed towards S. muricatum being grown in small areas and its introduction is still at the incipient stage. The situation is not the same in the countries where it has been introduced, however. Commercial crops produced with advanced technology are known in Chile, New Zealand and the United States (California) as a result of this fruit's acceptance on North American, European and Japanese markets.